The ProForm Thinline and Thinline Pro "desk treadmill" models both fall far short of our criteria for a treadmill desk, lacking the office esthetics, work-surface stability, and ergonomic adjustability, that we expect in this category. Sturdy exercise treadmill (though this is not useful in an office setting). Little to no attention paid to ergonomic adjustability, office esthetics, and other traditional treadmill-desk design considerations. The ProForm Thinline Desk Treadmill with a tablet controller. Depending on your objectives, ProForm Thinline or Thinline Pro "desk treadmill" could either be the perfect product for you (if you want to exercise), or might be the worst thing you could possibly buy (if you want to be comfortable and productive at work). The first hint of ProForm’s marketing sleight-of-hand is the reversal of the commonly used term "treadmill desk" to "desk treadmill." For this reason, the walking treadmills used for bona fide treadmill desk applications usually have a top speed of 2.0 or 2.5 mph, and no incline function. The goal is to raise your BMR (Basal Metabolic Rate) higher than when you’re just sitting or standing, to get your calf muscles pumping more blood back up to the heart, to keep your joints loose and well lubricated and nourished, etc. - but never to get anywhere near a cardio exercise heart rate. The moment you start sweating, the productivity benefits begin to disappear, cognitive skills decline, and, oh, yeah, you start sweating all over your desk – and, if you work in an office - into your business attire as well. As the name juxtaposition implies, the ProForm Thinline is a whole lot of treadmill and very little desk. It’s basically a $1,300 ProForm running treadmill with a flip-down console so you can place a laptop or Surface on it when you’re walking at, presumably, at slower speeds of 1 to 2 mph. The Thinline Pro has an adjustable-height feature on that flip-down console, for an extra $400. You’ll need a compatible tablet or other computing platform to continue to control the treadmill with the console flipped down. We’re actually quite surprised that the product was able to receive UL certification with only a wireless link between the controller and the treadmill, as this would seem to be a risky potential point of failure that could lead to injury at running speeds. Footprint and weight – Most people do not have the space for a treadmill desk in their office, so every square inch is at a premium. The Thinline is at least 13" longer than a bona fide office walking treadmill like the iMovR ThermoTread GT. 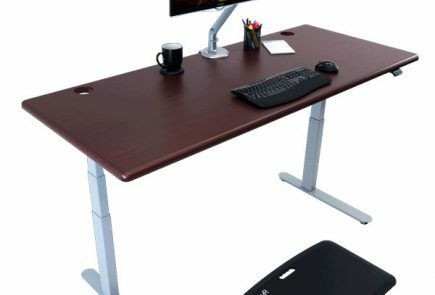 Of course the Thinline can fold up to a vertical stowage position – hence the name "Thinline" – but it folds the desk up along with the deck, so you’d have to move your computer and other articles over to a sitting desk to continue working. Doing this a few times a day will quickly become annoying. Lastly, at 350 lbs, the Thinline treadmill weights three times as much as a typical office treadmill. Bottom line is that this configuration may be fine for a home gym, but doesn’t work very well for the confines of the typical office. Ergonomics – Working at a treadmill desk introduces even more ergonomics issues than working at a sitting desk. With the belt pulling you back and your body constantly swaying, there is a strong tendency to press down very hard on the palms in order to maintain hand position over the key-caps. The faster you walk the harder it is to type, and the more time you spend correcting errors. That is why keyboard trays with steep inclines, and in particular desks with integrated SteadyType keyboard trays, are so essential to a good ergonomic setup. The Thinline treadmills offer neither a way to install a keyboard tray nor do they offer an integrated one. This is a setup ripe for carpal tunnel syndrome and other repetitive-strain injuries (RSIs) after prolonged periods of use. 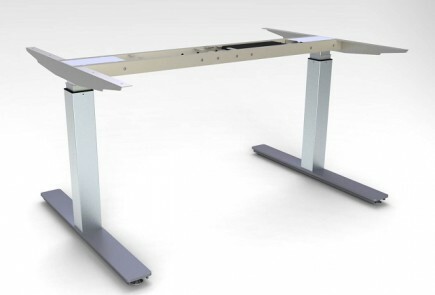 While the Thinline Pro at least has a height adjustable desk surface, the basic model doesn’t even offer this accommodation to ergonomic positioning. When it comes to typing comfort and productivity, the ProForm appears to have joined Steelcase and LifeSpan in having spent zero effort addressing treadmill-desk keyboard ergonomics. Worse, there is also no way to mount an external monitor, and peering down to your laptop’s built-in screen for any length of time is almost certain to cause neck and back strain. Reliability – Because ProForm hasn’t yet submitted their product to our testing labs and doesn’t publish full specifications that we can find, we can’t verify the type of motor that is used in the product. Like many treadmill manufacturers, they obfuscate the specs that an engineer would want to know and disclose only the horsepower rating. The Thinline uses a 2.75 HP motor, and the Thinline Pro uses an upgraded 3 HP motor, but we don’t know anything else about its torque rating, RPMs, power consumption, noise signature, or even whether it is an AC or DC motor. What we do know is that a DC motor has linear properties such that if the top speed of the treadmill is 12 mph, at 1 mph it would only produce 1/12th of the horsepower, and would be at high risk of burnout if used at very low speeds for long periods of time. The good news is these treadmills come with a lifetime motor warranty, but the hassle factor of dealing with a burned out motor, or controller (which has only a 5 year warranty), is still pretty significant, and you may still be on the hook for the diagnostic trip and the second trip to replace the motor once the replacement part comes in. Vibration – Again, we haven’t seen this unit in action yet other than observing people on YouTube walking on it but not actually typing on it. A principle of proper treadmill-desk design is that the adjustable-height desk and the treadmill are never physically bolted together. That’s not the case in the ProForm, so we suspect that every footstep will send oscillations up to the desk surface, no matter how heavy the steel frame is. The fact that the desk is made of a flexible plastic material makes matters even worse, and some users report that it is uncomfortable on their hands. These induced vibrations can affect your productivity, especially your typing accuracy. Key-cap travel distance on modern keyboards is so minute that any vibration in a treadmill desk set-up is invariably going to result in frustrating typos. Visual appeal – There’s no two ways around it, this is real gym equipment - large, bulky and unattractive in an office setting. Putting a treadmill desk together using a correctly designed walking treadmill base and an attractive, height-adjustable desk is easy nowadays – and there are literally hundreds of desk sizes, shapes and colors to choose from that will match your office or home décor. We don’t understand why anyone would want to install such a large treadmill in their office. In the home, maybe, but we just don’t see many offices that could accommodate this 350-lb behemoth. In blending both a running treadmill and walking workstation into a single unit, ProForm has attempted to design an SUV of sorts (i.e. a car/truck hybrid). While it may be a very good running treadmill it fails to meet even the minimum criteria for a healthy, productive treadmill desk. Our 1-star rating reflects only its appropriateness as a treadmill desk, as we don’t hold ourselves out as experts on running treadmills. That said, the few user reviews we were able to find online were critical of the running element, and mentioned nothing of the treadmill desking element. Our conclusion is that you could spend less money to get a running treadmill that is just as good. But if what you’re really looking for is a real treadmill desk to work at, our advice is to keep looking. See the numerous options available in the market on our treadmill desk review page. As soon as ProForm ships us a test unit we’ll update this review accordingly, of course. Subscribe to our free newsletter to make sure you stay abreast of all the latest office fitness product reviews, blog posts, and industry news. The ProForm Thinline Desk Treadmill is covered under a lifetime warranty on the frame and motor. It's worth mentioning iMovR's EcoLast TreadTop Standing Mat as a great add-on for the Thinline, or any office treadmill, for that matter. When you want to take a pause from walking the last thing you want to do is stand on the cushion-less hard deck of a treadmill for very long, lest your feet start to suffer. These TreadTop mats are premium-quality, 100% polyurethane standing mats that are cut to size to specifically fit popular office treadmill models. 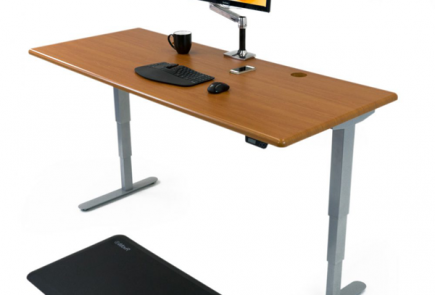 They can be used atop the desk or astride the treadmill if you have a sit-stand-walk workstation, or both. Be sure to check out our 5-star review of the TreadTop Anti-Fatigue Mat. For the ProForm Thinline you'll want the 20" x 32" version that'll fit comfortably between the side rails.